Doc is our star. If we had a sign out front that said, “Iron Horse Ranch, Home of…,” he would be featured! We are so proud of him and his accomplishments! When we bought Perky, we were looking for a mare that was in foal, so that Abby and Easy would have some company. We couldn’t have been more surprised when we were told, after Doc was born at Lazy E Ranch, that they considered him to be among the top 20 foals born there that spring (out of about 400). At age two, he spent seven months with cutting-horse trainer Greg Beutenmiller. He did well there, but is going to be too big to be a great cutter. He has lots of “cow,” however, and lots of potential in cow-related events that would make better use of his speed. He is our fastest horse. 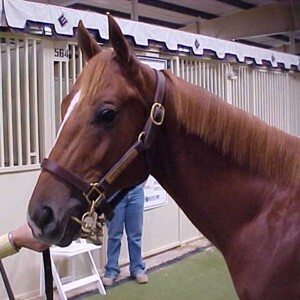 He never fails to be at the head of the herd when they arrive at the barn “en masse.” His speed, combined with the tremendous athletic ability that allowed him to do pretty well at cutting, could make him a great barrel horse. 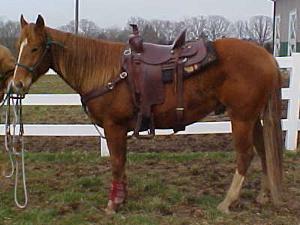 He looks great under saddle. 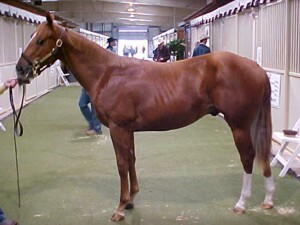 His trainer, Greg, felt that he might also have the potential to be a very good Western Pleasure horse. We think his speed and power might also make him an excellent roping prospect. The best thing about having Doc around Iron Horse Ranch, however, is his wonderful, open, willing, cooperative personality. He’s always ready to leave the pasture and do something interesting with John. Right now, he’s learning to carry a pack saddle and all the accoutrements that go with it, in preparation for an upcoming elk-hunting trip!